“It’s designed to mimic the mother’s womb,” Janis McKellar told TODAY’s Matt Lauer, Meredith Vieira and Ann Curry Friday in New York. As she spoke, her 14-month old son, John, sat serenely in his Tummy Tub, flanked by other parents and their babies, who seemed delighted to be bathing in warm water while curled up in fetal position. The tub is made of nontoxic materials and has a low center of gravity, so it doesn’t tip over. 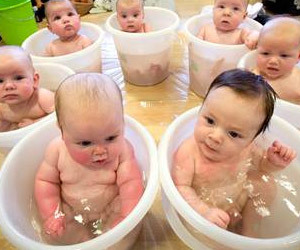 It requires much less water than traditional infant tubs, she said, and because it has a small surface area, the water stays warm longer.